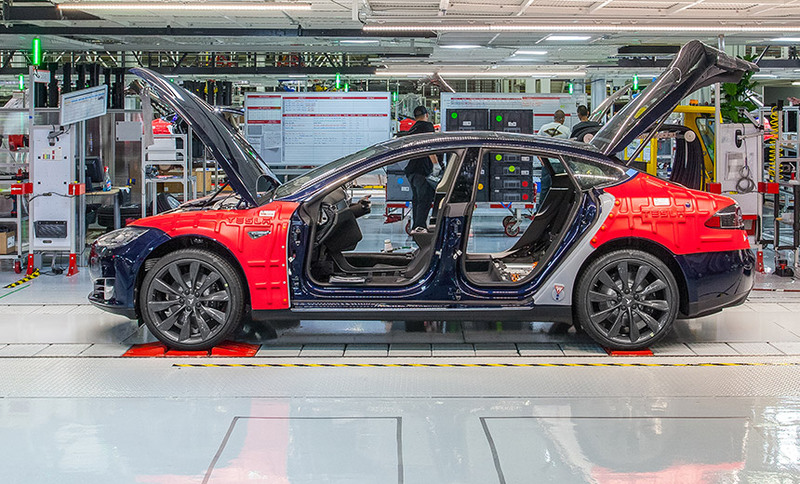 Tesla, which builds electric vehicles, energy storage devices and solar panels, is based in Palo Alto, California. 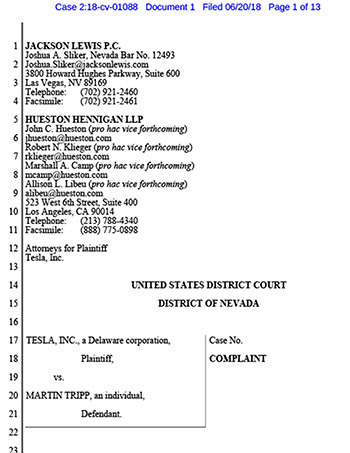 Tesla’s complaint against Martin Tripp. The company’s lawsuit names Martin Tripp, a former process technician at the company’s Gigafactory in Nevada, who was hired in October 2017. 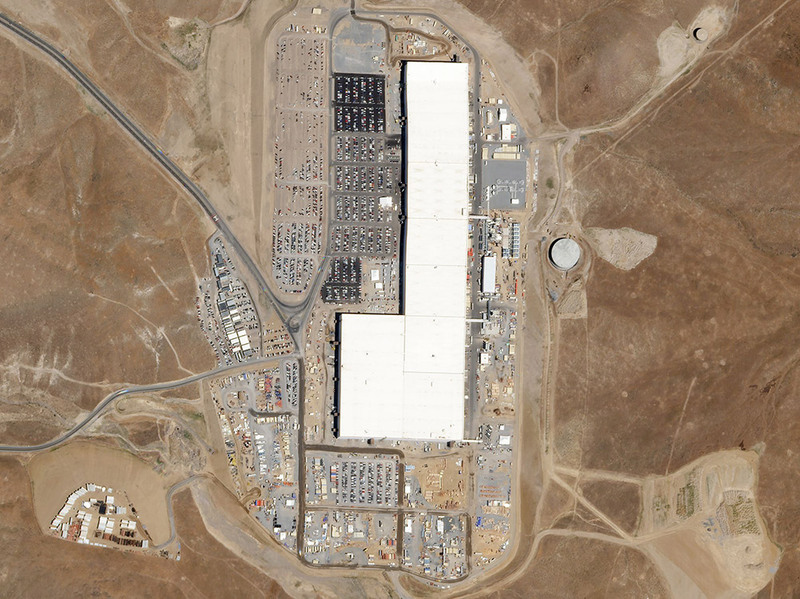 Tesla’s Gigafactory is a massive factory under construction in Sparks – outside Reno, Nevada – designed to produce lithium-ion battery packs. The lawsuit accuses Tripp of violating federal and state trade secrets laws as well as Nevada computer crime laws. According to the lawsuit, Tripp has admitted to some of the allegations against him, including hacking the company’s systems and exfiltrating data to unnamed third parties. “Tesla has only begun to understand the full scope of Tripp’s illegal activity, but he has thus far admitted to writing software that hacked Tesla’s manufacturing operating system (‘MOS’) and to transferring several gigabytes of Tesla data to outside entities. This includes dozens of confidential photographs and a video of Tesla’s manufacturing systems,” according to the lawsuit. But Tesla has also accused Tripp of modifying software so as to automatically exfiltrate data as well as laying false flags to make it look like other, innocent employees were responsible for the theft. Although Tripp was hired as a process technician, he was transferred to a new, unspecified job role on May 17, following poor performance reviews. “Within a few months of Tripp joining Tesla, his managers identified Tripp as having problems with job performance and at times being disruptive and combative with his colleagues,” the lawsuit states. Subsequently, Tripp appears to have been fired. Elon Musk, the founder and CEO of Tesla, on Sunday told employees in an email, obtained by CNBC, that he learned over the weekend that there had been a saboteur inside Tesla. “I was dismayed to learn this weekend about a Tesla employee who had conducted quite extensive and damaging sabotage to our operations. This included making direct code changes to the Tesla Manufacturing Operating System under false usernames and exporting large amounts of highly sensitive Tesla data to unknown third parties,” Musk wrote. The employee allegedly said his actions were in reaction to his not having received a desired promotion. “The full extent of his actions are not yet clear, but what he has admitted to so far is pretty bad. His stated motivation is that he wanted a promotion that he did not receive. In light of these actions, not promoting him was definitely the right move,” Musk said. Musk called on employees to “please be extremely vigilant” and to email the company – anonymously or otherwise – if they saw signs of anything suspicious. Information Security Media Group could not independently confirm any of the claims made in the email or lawsuit. On Monday, meanwhile, Musk sent another email to employees about a “small fire” on Sunday at the company’s Fremont, California, in its “body production line,” saying it wasn’t clear if it was random.